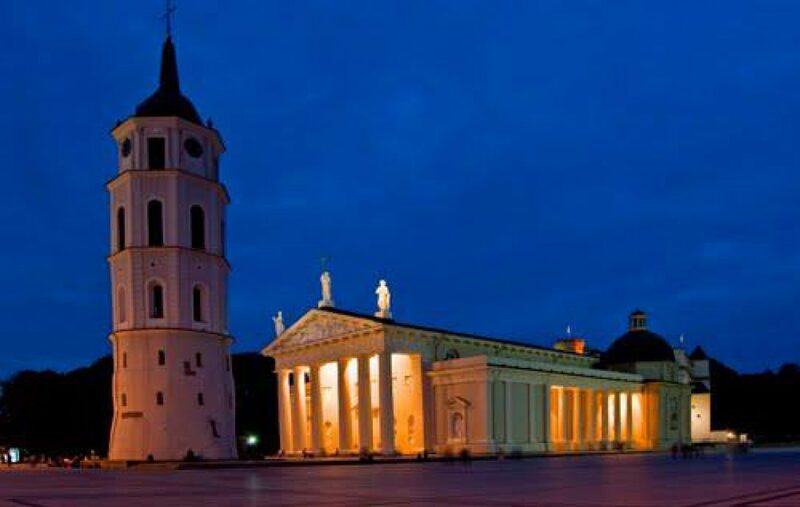 LITHUANIA, southernmost of the three Baltic States, has a complex and fascinating history. It was once one of the largest and most tolerant states in medieval Europe, the Grand Duchy of Lithuania, which had a diverse population of ethnic Lithuanians, Slavs, Tatars and others, and a religious spectrum that included Pagans, Jews, Muslims and Christians, and expanded eastward and southwards from the current land of Lithuania to include what today is Belarus, Ukraine and part of Poland, connecting the Baltic Sea to the Black Sea! It was also the last Pagan state in Europe, with Pagan rulers and a mainly Pagan population until 1387. That is when Lithuania’s rulers took up Catholicism as a condition of forming a “personal alliance” with Poland in which both countries would be ruled by a king of Lithuania descent, the Jagiellonian dynasty. When tensions with Russia erupted into the Livonian War of 1558-1583, the Lithuanian-Polish joint monarchy transformed in 1569 into the PLC, the Polish-Lithuanian Commonwealth, also known as the Republic of Two Nations, the chief rival of the emerging Russian in the 17th and 18th centuries. Then the PLC, and with it, Lithuania disappeared…carved up like a Thanksgiving turkey by the surrounding imperial states of Prussia, Hapsburg Austria and Tsarist Russia in the infamous “partitions of Poland-Lithuania” of the 1770s-1790s, during which, each of the three surrounding empires took a piece of the PLC for itself. Lithuania became the westernmost province of Tsarist Russia, similar to how it would later be one of the westernmost republics of the USSR. The Lithuanians rose up against Russian rule in 1831 and again in 1863-64, the second rebellion resulting in harsh reprisals including the prohibition of books in the Lithuanian language printed in the Latin alphabet, as only Russian books printed in Cyrillic were allowed. This relaxed a bit after the Revolution of 1905, which scared Tsar Nicholas II into treating the restless, conquered peoples a little better, but the real change came in 1918 when Lithuania became independent after the defeat of Russia in WW I and the collapse of the Russian state. From 1918 to 1940, Lithuania was an independent republic, minus Vilnius, which was part of Poland during this period, with a Polish majority population. Caught between Nazi Germany and Soviet Russia, Lithuania suffered mightily in WW II, invaded first by Russians in 1940, then Germans in 1941, then Russia again in 1944, resulting in Lithuania becoming part of the Soviet Union until 1991, when independence was restored with the collapse of the Soviet Union. Lithuania, Latvia and Estonia collaborated in a joint protest on August 23, 1989 in which a human chain was formed across all three republics to protest the 40th anniversary of the Molotov-Ribbentrop, Soviet-Nazi agreement that had paved the way for the Baltic States to be absorbed into the USSR. One of the forms of protest was singing national folk songs forbidden under Soviet rule in the three Baltic States, hence the phrase, “The Singing Revolution.” Lithuania was the first soviet republic to proclaim its independence in 1990, which led to a Soviet invasion in early 1991 that backed down when thousands of Lithuanians poured into the streets of Vilnius to confront the tanks. Since 1991, Lithuania has developed itself continuously, joining the EU and the NATO alliance in 2004 and adopting the Euro as its currency in 2015. The one sad part of Lithuania’s generally upward path in recent years is the loss of many younger Lithuanians who have chosen to migrate to other countries in Europe for better economic and professional opportunities. Previous Post Why Travel to Eastern Europe?